Designed for students who have had at least one year of Russian, this textbook is appropriate for the 3rd, 4th, or 5th semester and can be covered in one or two semesters. It is the middle course of the series of Russian textbooks produced by the Upstate New York writing team from Cornell and Colgate universities (Beginning Russian and Advanced Russian are the others), but it can be used in any other sequence of texts. The main part of this book consists of 18 lessons, all with the same tripartite structure: texts, dialogs, and exercises. The texts are a coherent, smooth-flowing abridgement of the classic novel by Il'f and Petrov. The dialogs are designed to develop fluency in the spoken style of literary Russian. The exercises are divided into four groups: text exercises, dialog exercises, grammar exercises, and a translation. The texts and the dialogs are accompanied by extensive comments on Russian grammar, style, and culture. The text exercises are designed to develop the art of paraphrasing and the dialog exercises offer practice in using familiar cliches and conversational gambits. The grammar exercises are based primarily on the section of the book that follows the 18 lessons, the Overview of Russian Conjugation by Alexander Nakhimovsky. This section contains a detailed analysis of the verb system: the prefixes, suffixes, and the types of roots that play a role in Russian word formation. Although there is considerable overlap between the three main parts of each lesson in terms of grammar and vocabulary, it is possible to use them independently and to skip one or another of them. Information on the inflection of Russian words is given in a 12-page section on Russian Endings at the end of the book. This concise review of the rules for adding endings onto stems also contains extensive illustrative paradigms of nouns, adjectives, and verbs. The rules given in this section are essentially the rules of Beginning Russian, but some of them are more detailed. This section also serves as a guide for using the exhaustive Russian-English glossary, which contains all of the content words of the book along with their morphological characteristics (stress patterns, irregular forms, aspect partners, etc.). This inflectional information is based on A.A. Zaliznjak's grammatichskii slovar' russkogo iazyka. There is also a complete English-Russian word index. Each lesson has additional readings in the form of a dialog between two students; this provides vocabulary for discussing courses, teachers, textbooks, impressions and thoughts about fictional characters, etc. Short displays of Russian roots are interspersed among the lessons. The book is beautifully illustrated with reproductions of the original Kukryniksy drawings. 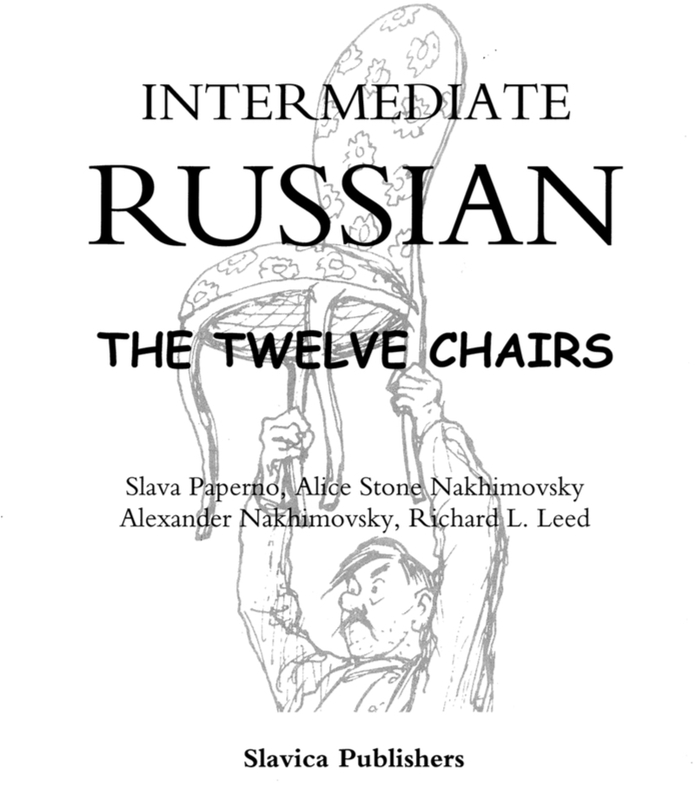 For technical and legal reasons, Slavica Publishers no longer carries the The Twelve Chairs DVD-ROM However, more than a dozen films based on the novel 12 Chairs have been produced worldwide. Some of them are easily available on DVD or online today: The Twelve Chairs, 1970, directed by Mel Brooks, in English 12 стульев, 1976, четырех-серийный телевизионный художественный фильм, режиссер Марк Захаров, на русском языке. At the time of this writing, the film can be watched without restrictions at http://youtu.be/RhlPZuPmOS8. Двенадцать стульев, 1971, режиссер Леонид Гайдай, двух-серийный художественный фильм на русском языке. At the time of this writing, the film is offered by Mosfilm for free unrestricted viewing at http://cinema.mosfilm.ru/films/film/Dvenadtcat-stulev/dvenadtsat-stulev-1/. Contact the author of the book, Slava Paperno for more information: slava.paperno@cornell.edu.